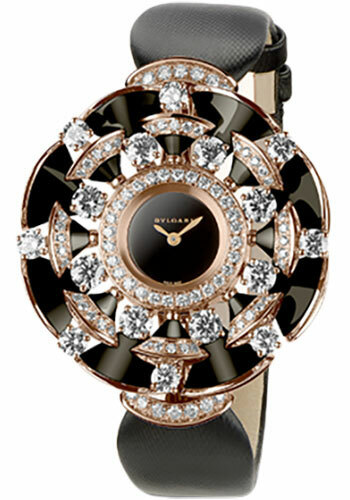 39 mm 18-ct pink gold case set with diamonds and onyx, black dial, quartz movement, black satin strap, 18-ct pink gold buckle set with diamonds. 39 mm 18-ct pink gold case set with diamonds, peridots, rubellites and amethysts beads, white mother of pearl dial, quartz movement, black satin strap, 18-ct pink gold buckle set with diamonds. 39 mm 18-ct pink gold case set with diamonds, rubellite and mother of pearl, white mother of pearl dial, quartz movement, white satin strap, 18-ct pink gold buckle set with diamonds. 39 mm 18K pink gold case set with brilliant cut diamonds, white mother of pearl dial, quartz movement with hour minute functions, alligator strap, 18K pink gold folding buckle set with brilliant-cut diamonds.